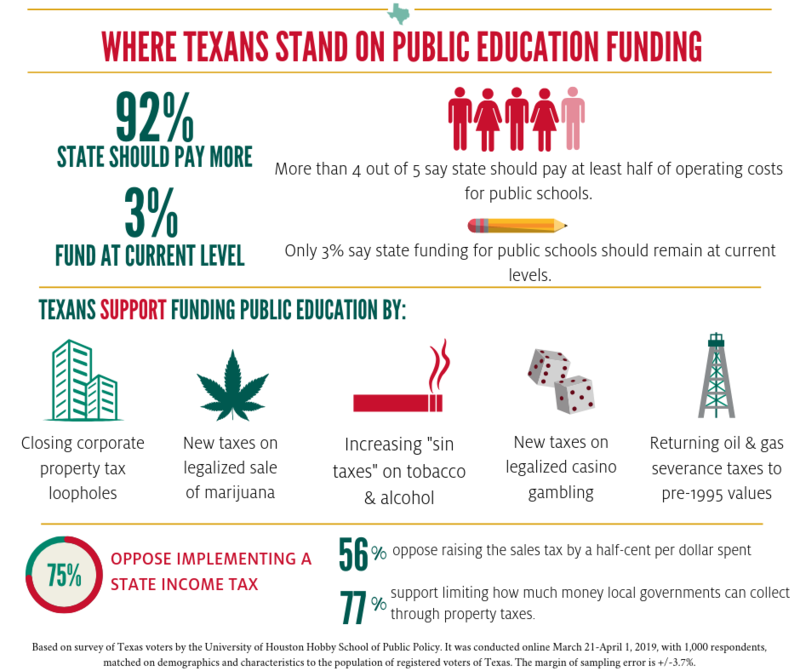 A survey of Texas voters by the University of Houston Hobby School of Public Affairs found strong support for increasing the state’s share of funding for public schools, along with support for increasing several targeted taxes to pay for it. That included 62% who said they favor legalizing and taxing marijuana for recreational use. But more than two-thirds of respondents also said they consider property taxes in Texas to be high – almost one-third said they are “very high” – and more than 75% support limiting how much money local governments can collect through property taxes. The survey also suggests voters may not support a plan announced by state leaders to raise the state sales tax by 1% in order to reduce property taxes; 56% opposed raising the tax by a half-cent per dollar spent. Moreover, Texas voters expressed strong opposition to extending the sales tax to grocery sales and non-prescription medicines. The state’s top elected officials have labeled school finance a priority, and the House approved a bill earlier this month that would increase base funding for each student, provide across-the-board raises for most full-time school employees and lower school tax rates. Deliberations on property tax proposals are continuing. Respondents support closing loopholes that allow corporations to avoid paying taxes on the fair market value of their property, returning oil and gas severance taxes to their higher pre-1995 values and increasing taxes on cigarettes and other tobacco products, along with those on wine, beer and other alcohol products. There also was support for creating new taxes on legalized casino gambling and the legalized sale of marijuana for recreational use. Three-fourths of voters oppose a state income tax, and a majority also oppose increasing the state sales tax and imposing a 1% tax on groceries and non-prescription drugs, which are currently exempt. Pablo M. Pinto, associate professor at the Hobby School and director of the Center for Public Policy, noted strong support for early childhood education, increasing funding in districts which serve more low-income students, and granting teachers a $5,000 raise. The full survey is available at the Hobby School website. It was conducted online March 21-April 1, 2019, with 1,000 respondents, matched on demographics and characteristics to the population of registered voters of Texas. The margin of sampling error is +/-3.7%.